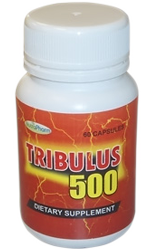 Tribulus 500, contains a strong 500mg of Tribulus terrestris extract (40% saponins). Tribulus terrestris is a natural testosterone booster, most often used for infertility, erectile dysfunction, and low libido. And is also popular to improve sports performance.